In recent years, many up-scale residential projects have begun to provide their residents various services in order to differentiate themselves in the market. Collective wine cellars have recently become a leader amongst these services. As wine gains more popularity each day, more and more people are eager to have a wine cellar of their own. Unfortunately, it is not always possible to reserve enough room in an urban setting to realise a walk-in wine cellar in each dwelling. Developers’ response to this demand has been the collective wine cellar which is a very efficient, energy-conscious and prestigious solution to the problem. A collective wine cellar is, in fact, many personal cellar units in one ‘grouped’ cellar space while each individual unit is secure, and only accessible to its owner. These units are not totally closed off and allow air to circulate amongst the wine bottles. Collective cellars can be equipped with a wine cellar management system which is accessible via internet and enables the residents to view the details of their collection. 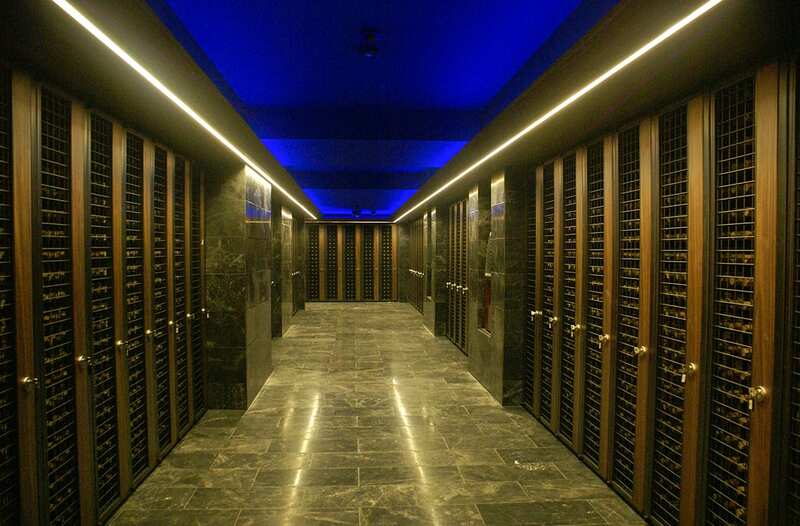 Furthermore, the cellar area is surveyed 24 hours a day, via CCTV cameras and the building’s central automation system, to make sure that the valuable wine collections are safe and always kept under the right climatic conditions.